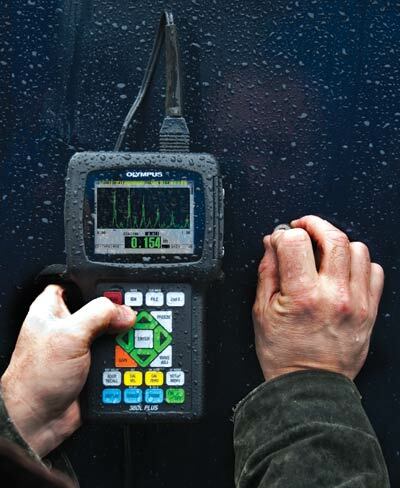 The 38DL PLUS is an advanced ultrasonic thickness gage. Uses dual element transducer for internally corroded applications, features include THRU-COAT and Echo-to-Echo. Uses single element transducers for very precise thickness measurements of thin, very thick, or multilayer materials. The 38DL PLUS is an innovative instrument that signals a new era in ultrasonic thickness gaging. Ideally suited for almost every ultrasonic thickness application, this handheld thickness gage is fully compatible with a full line of dual and single element transducers. The versatile 38DL PLUS can be used in applications ranging from wall thinning measurements of internally corroded pipes with dual element probes to very precise thickness measurements of thin or multilayer materials with single element transducers. The 38DL PLUS comes standard with many powerful but easy-to-use measurement features and a host of application-specific software options. Its sealed case is designed to meet IP67 requirements to withstand the rigors of very wet or dusty environments. The color transflective VGA display provides superior readability from bright sunlight to complete darkness. It features a simple, ergonomic keypad that can be operated with the left or right hand for easy access to all functions. What Makes This Thickness Gage Different From Others? The 38DL PLUS is designed to meet the challenges of demanding applications and built to withstand tough conditions in the field and on the production floor. Whether you work in very wet or dusty conditions, cold or hot climates, or bright or dark areas, the 38DL PLUS can handle any inspection job. Need an instrument tough enough to tolerate shocks, drops, and rough handling? The 38DL PLUS with its protective rubber boot and designed for IP67 rating is your answer. • Explosive Atmosphere: Safe operation as defined by Class I, Division 2, Group D, as found in the National Fire Protection Association Code (NFPA 70), Article 500, and tested using MIL-STD-810F, Method 511.4, Procedure I. • Shock tested using MIL-STD-810F, Method 516.5, Procedure I, 6 cycles each axis, 15 g, 11 msec Half sine. • Vibration tested using MIL-STD-810F, Method 514.5, Procedure I, Annex C, Figure 6, general exposure: 1 hour each axis. 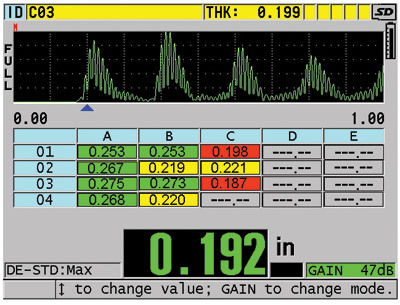 The 38DL PLUS has a full-featured internal bidirectional alphanumeric data logger that is designed to easily collect and transfer thickness readings and waveform data. 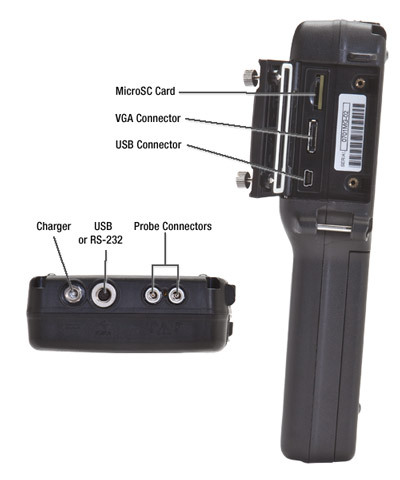 • GageView™ interface program can communicate with the 38DL PLUS using the USB, RS-232 ports, and can read and write to a MicroSD memory card. • The GageView interface program, a Windows-based application, collects, creates, prints, and manages data from the 38DL PLUS.